Pushed by leftist activists and legislators like Rashida Tlaib, the Democratic Party is finally having it over Israel. It's a long-overdue step toward changing US foreign policy and challenging Israel's occupation. Shortly after their election this past November, a number of freshman left-wing congressional Democrats announced that they would not be embarking on one of Washington’s most sacred rites of passage: an American Israel Public Affairs Committee (AIPAC)–organized trip to Israel. These trips, which cost AIPAC around $10,000 a person, are essential instruments of the country’s largest pro-Israel lobbying group. They present an illusion of political moderation (the politicians meet with a handful of AIPAC-selected Palestinians) and gesture at a forgotten tradition of bipartisan Beltway consensus. 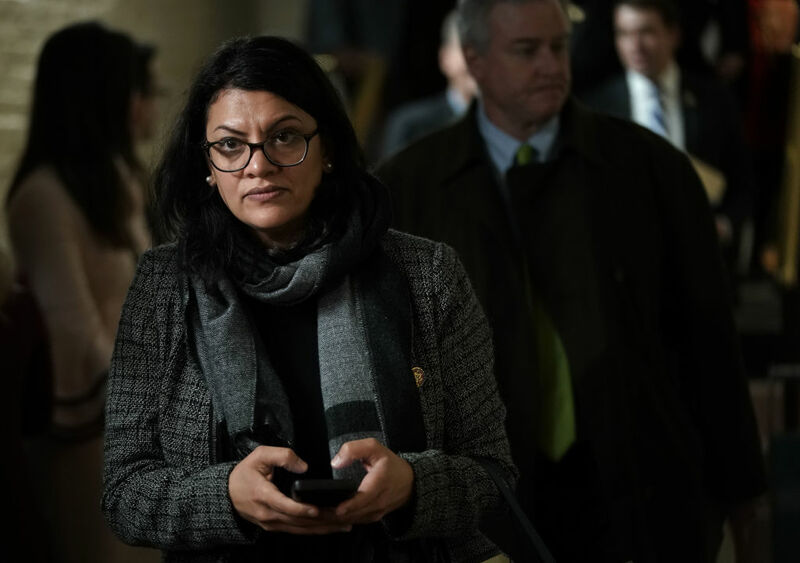 Michigan representative Rashida Tlaib, the freshman most vocal about AIPAC and the Israeli occupation of Palestinian lands, and herself a Palestinian-American, went a step further this week. She aims to organize an alternative congressional delegation to the West Bank, completely unattached to AIPAC. In response, New York representative Eliot Engel, the Democratic chairman of the Foreign Affairs Committee and a staunch AIPAC loyalist, told journalists that “instead of [Tlaib] talking about things, she’s new here, she ought to listen and learn and open her mind and then come to some conclusions.” Tlaib, in turn, invited Engel to join her in Palestine. The Senate vote concerned what was initially a fairly standard measure written to reauthorize foreign aid to the Israeli and Jordanian governments, but Senate Republicans (Marco Rubio chief among them) with the assistance of AIPAC amended the “Strengthening America’s Security in the Middle East Act of 2019” with the BDS provision in order to, as the New York Times put it, “draw out the new generation of insurgent liberal representatives who have been critical of Israel.” The bill passed 74–19, with seven abstentions. The lopsided roll-call vote belies the bitter fight over the bill during the past two months. Senate Democratic leaders who ended up voting for the bill, including Minority Leader Chuck Schumer, all refused to even consider the legislation until Republicans agreed to a bill that ended the government shutdown. At the same time, civil rights groups like the American Civil Liberties Union exerted significant leftward pressure on Democrats not to support the bill at all because of the First Amendment implications of the Rubio-added provision targeting BDS activism. Though Senate Democrats showed rare spine in refusing to vote for the bill during the shutdown, a slim majority of them ultimately voted to pass the bill this week. However, of the bold-name 2020 contenders in the Senate — Bernie Sanders, Elizabeth Warren, Kirsten Gillibrand, Kamala Harris, and Cory Booker — it is notable that the first three voted “no” and the last two did not vote. Harris and Booker are a different story. Both politicians have long had friendly relationships with pro-Israel groups (excepting Booker’s vote for the Iran deal in 2015), and both have courted influential pro-Israel donors. Harris gave a private speech at AIPAC’s annual conference in Washington just last year. Their defections, while an aberration given the Democratic Party’s still-strong support for Israel in the Senate, suggest that new lines about what it means to be pro-Israel are being drawn ahead of 2020. Pro-Israel forces in the Democratic Party establishment see which way the wind is blowing, which explains the arrival of the Democratic Majority for Israel (DMFI) and its affiliated PAC to support pro-Israel Democrats. The purpose of DMFI, as described by the New York Times’s Jonathan Martin, is “to counter the rising skepticism on the left toward the Jewish state by supporting lawmakers and candidates in 2020 who stand unwaveringly with the country.” Sometime later this year, the group will officially launch a political action committee to directly fund candidates who align with the group’s vision; according to Martin, though not officially a part of DMFI, House Democratic Caucus chair Hakeem Jeffries could “be one of the first beneficiaries of the new group” to help him ward off a future primary challenge from the left. Noah Kulwin is a staff writer for Jewish Currents based in New York City. He has written for VICE News , New York , the Baffler , and elsewhere.